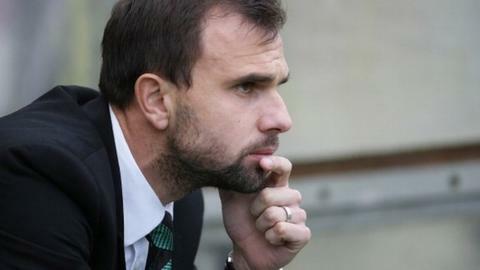 Plymouth boss Carl Fletcher is unhappy that a section of the club's fans are criticising some of his players. Fletcher's side drew 1-1 with Bristol Rovers and believes supporters should focus on backing his young squad. "I'm a little bit disappointed with the way the fans got on some of the lads backs straight away," Fletcher told BBC Radio Devon. "They're all young lads and nobody's perfect, it was a case of it's easy to sit there and have a moan at players." The Argyle boss added: "I've got Youngy (Luke Young) and Conor (Hourihane) there, they're 19 and 21 in midfield and Matty's (Lecointe) only 17, they need encouragement not people getting on their backs. "But they saw it through and they kept trying to do the right things." Argyle took the lead through Hourihane's 30-yard strike, but Rovers replied with 20 minutes to go. "Going a goal up, yes we're disappointed, but in the general performance we didn't have that spark there," added Fletcher. "We were working hard to try and get that something to get us going but it just wasn't there. "It was a good goal from Conor, he probably could have scored in every game this season, and it's nice for him to get his goal. "He's been desperate to try and get more goals from midfield so I'm pleased for him."